Mentioned is the way you can write Physics Teacher CV Template . 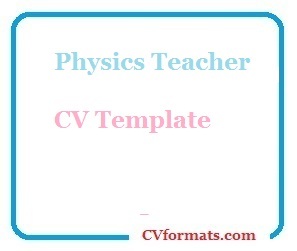 People looking for jobs can easily download these Physics Teacher CV Template in word or pdf format or just view it online to copy and paste. Cover letter of Physics Teacher CV Template is also available. Just change the name , address , qualification and experience and your Physics Teacher CV Template is ready. A confident, enthusiastic and hard working physics teacher who is able to teach students across the secondary age range, whilst at the same time encourage them to develop their skills, knowledge and confidence. Possessing extensive knowledge of contemporary teaching methods and having immense subject knowledge, enthusiasm and charisma, as well as a genuine interest in educating others. John is presently looking for a acceptable teaching positions with a suitable school where he will be able to widen his teaching experiences. Able to conduct classes in a disciplined environment where children are challenged. Qualified Teacher Status (PGCE, B.Ed, GTP, BA (QTS). Comprehensive knowledge of national and local curriculum policies. Knowledge of physics principals, laws, atomic structures & processes.